The NHL and Rogers cemented their 12-year, $4.9 billion ($5.2 billion Cdn) television contract this week that transforms the media landscape in Canada and how the game will be covered over the next decade-plus. The first 10 years of Bettman’s NHL stewardship were rudderless and ineffective. But since the 2005 NHL lockout, the League has had a combination of good fortune (Crosby vs. Ovechkin, the resurgent Original Six franchises) and smart decisions (rules changes, outdoor games). Bettman was at the heart of two work stoppages, but helped lead the League back both times. Now comes this Canadian rights deal. He’s grown the business in ways no one could have anticipated, and deserves credit for it. The only knock is where the NHL could be if it weren't for labor hiccups and marketing decisions, but that's speculation. 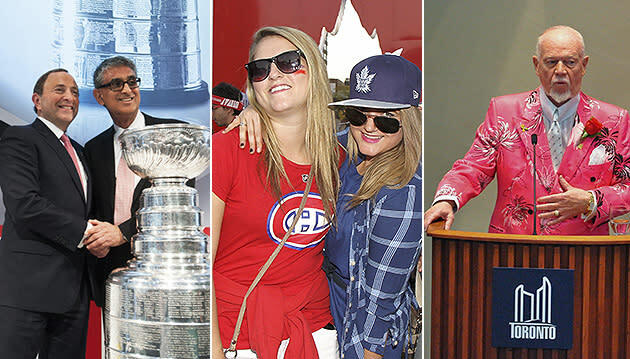 The COO of the NHL was, perhaps, Bettman’s greatest move as commissioner. His unparalleled business sense led to the creation of tent-pole events like the Winter Classic, and his work on the League’s rights deals led directly to the $4.9 billion, 12-year agreement with Rogers. He said recently that he wanted to take the NHL from a $3.2 billion company to a $4 billion one; so what’s next? "HNIC" is going to go multi-platform all over the Sportsnet properties every Saturday night, giving the brand a footprint it’s never experienced before. The reach of "HNIC" is finally going to match the prestige. Everywhere you flip, you’re going to see that logo. Well, outside of TSN. TVA Sports gets the exclusive French-language component of this deal, which means they get all the Montreal Canadiens’ playoff games and, after next season, all the Montreal Canadiens games (one assumes) when their RDS contract is up. And RDS, in case you’ve never seen it, is essentially Habs TV. This is a knockout punch. TVA is owned by Quebecor media, whose former CEO is a potential expansion owner of a Quebec City NHL franchise. Does this deal increase the likelihood that the NHL expands there? We still think it’s Seattle and a second team in Toronto, but who knows? The bottom line: If there is a second Toronto team, how many chips will TSN push into the pot in order to secure those rights now? Ditto a Quebec City team and RDS. It'll be another NHL TV rights windfall. The NHL’s salary cap is going to rise. That’s not a surprise. How high is the question, and James Mirtle of the Globe & Mail took a run at it earlier this year based on 6 percent growth for the League. His estimate? A $75.3 million salary cap by 2017 and a $90.3 million salary cap by 2020-21. Congratulations, Philadelphia Flyers! The era of national games being blacked out regionally is over in this new deal. Huzzah! TSN doesn’t really win much in this deal, but here’s a place where they might. The cozy relationship between the network and the League as a rights-holder had, in the eyes of some, damaged its credibility. Harsh criticism of the League had no home there. Will that change now that TSN is on the outside, looking in? Hopefully. TSN has the assets to really dig into tough issues. TSN’s loss could be NBC’s gain should they opt to take advantage of it. Talent like James Duthie, Darren Dreger and Ray Ferraro could be looking for new addresses. With Liam McHugh in studio, the Duthie fit might not be perfect, but he’s as good as it gets. NBC lacks the kind of insider voice Dreger could provide. And Ferraro is one of the best analysts working today. Any number of ex-TSNers could bolster the Peacock’s coverage of the League. Sportsnet’s most prominent host and insider are now the most prominent host and insider for the only network in Canada with exclusive NHL rights for the next 12 years. Millard was like a kid on Santa’s lap during the press conference, provided the kid was a 43-year-old agent of sarcasm from Manitoba. Sportsnet’s commitment to hockey, on all of its platforms, could bring fans closer to the game than every before. They’re always run ahead of Bell Media on the digital content side. 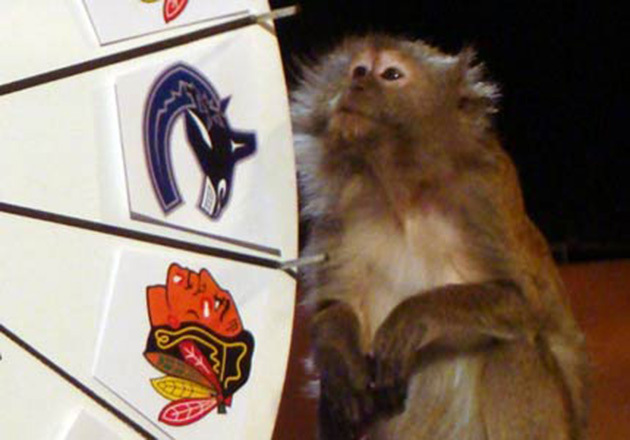 On the air, Sportsnet is going to blow it out, including what one imagines will be at least one hockey-only network. Grapes could appear on seven different networks, sometimes on the same night, under this agreement. At least that’s what Sportsnet chief Keith Pelley seemed to indicate. Is your television’s color balance ready for that monsoon of jacket patterns? 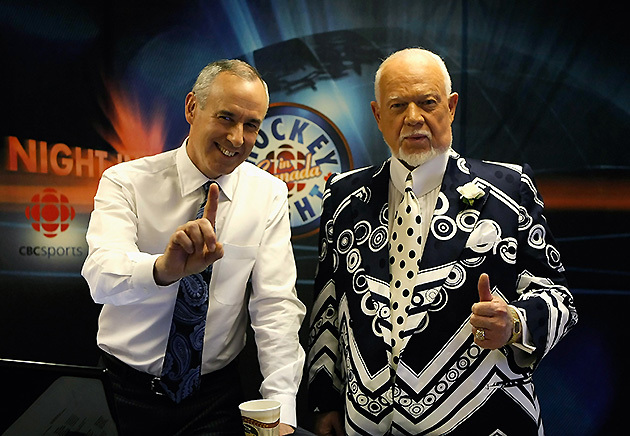 Editorial control means editorial control, and while Don Cherry grew bigger than “HNIC” he isn’t bigger than Rogers. This isn’t going to say they’re going to muzzle him – what’s the point of Don Cherry then? – but how many more of these are we going to see from Grapes under this new corporate agreement? “Hockey Night In Canada’s” ad revenue now goes to Rogers, as CEO Hubert Lacroix said CBC won't earn a dime directly from the show. Half of the network’s revenue comes from hockey. Sportsnet controls the ad sales and the editorial content. CBC expects to lose jobs and, in four years, is expected to lose hockey altogether as “Hockey Night” shifts to a Rogers property. It’s the beginning of the end for an institution for Canadian sports media. 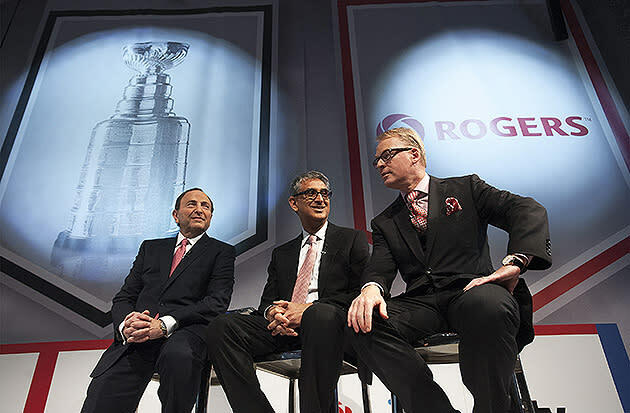 There’s no telling how Rogers intends to manage this program, but its days as an independent alternative to the great TSN vs. Sportsnet wars is at an end. We’re pretty sure the tech side will be downsizes; what does this deal mean for on-air talent? What does this mean for Hot Stove? Uh … er … well, there’s still money in ringtones. No matter if you’re Team Sportsnet or Team TSN, you have to tap the stick for the way the latter covered the game. They had innovations in camerawork and reporting, like the “inside the glass” stuff. They had studio shows that felt like appointment viewing. They had insiders that you felt were completely connected, sometimes to a fault. And they whole thing always looked gorgeous and expensive. The end of its NHL coverage comes as no fault of their own. One of TSN’s greatest advantages, and one could argue a blessing and a curse, was its access to the NHL as a rights holder. Does that access change now? How dramatically? And how will that hockey news be presented without a studio show? The arms race for information between Sportsnet and TSN was great for fans; hopefully we don’t lose that, or the steady diet of insider news from McKenzie, LeBrun and Dreger. Let’s face it: TSN’s “too close to the League” problem could become Sportsnet’s now that they’ve struck this 12-year deal with them. As Chris Botta put it: “Curious to see how switch in NHL rights-holders affects some analysts' commentary on league officials/issues on Twitter and on air.” Yup. While the Rogers deal opens up a ton of new jobs on its various platforms, the fact is that when those contracts are up it’ll be Rogers bidding against itself. TSN is out of the game for 12 years. There is no “other guy.” But you know who you should really feel for? Ex-coaches, who always seemed to find a happy home at TSN until their inevitable rehiring somewhere. Oh well, there are always hockey camps and Jay Feaster teams. Having had the honor of working on Sportsnet’s Trade Deadline show, I can tell you that you never saw a more fired up and competitive approach to what’s in reality eight hours of nothing. TSN brought that out of them, serving up its own massive Trade Deadline programming featuring white guys with BlackBerrys at wooden tables. Have we lost the delightful WCW vs. WWE aspect of that media rivalry? The NHL’s NBC deal was criticized by some for eliminating the league’s chances to maximize its potential with other suitors as the media landscape changes – like, for example, the money it could have made if the package was shared with Fox Sports 1. Now, in Canada, the NHL is casting its lot with one network for 12 years. The NFL will now have to contend with "Hockey Night In Canada Part Deux" on Sportsnet. Wither his comedic talents and/or friendly media platform?